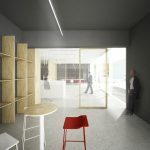 This proposal is showing the redesign and modernisation of office spaces of company Pyronova in Modranka, Trnava. 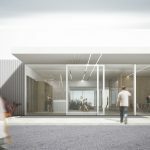 The main determinant of proposal was creating main, easily identified building entrance and new representative spaces for presentation of company. 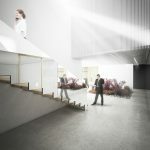 Architectural proposal is formed based on work with light in interior. Central space is formed by entrance hall with reception area, which present main interior dynamic element. 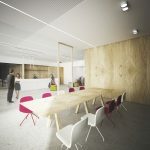 Overall airness of the space is being enhanced by the use of light flooring and by visual connection with meeting rooms, staircase area and presentation „demo“ room. Changes on the second floor are proposed in terms of optimalization of circulation. Originally insufficiently lighted and closed spaces are now changed so spaces can provide optimal requirements for working environment.